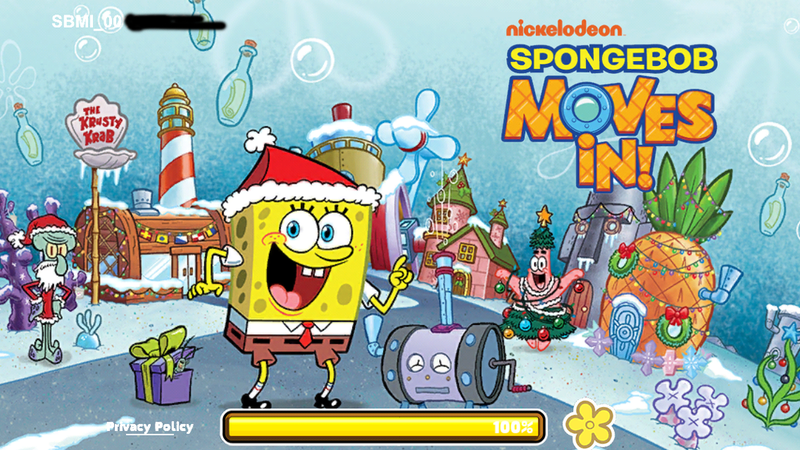 Holidays 2014 - The SpongeBob Moves In Guide Site! 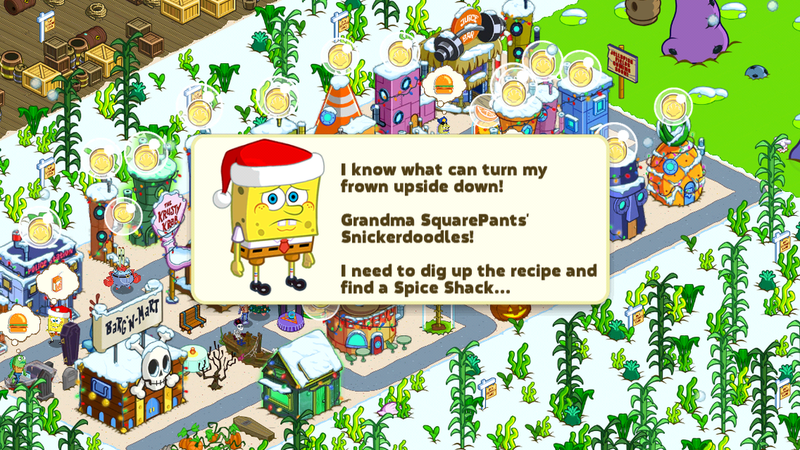 On December 3rd, Nickelodeon pushed Version 4.22.00, officially kicking off the Holidays 2014 Event, featuring bits of storyline from episode 28, "Christmas Who". The Bottle Shooter makes a debut, move in a Giant Coral Tree (that used to belong to Squidward), and spread holiday joy by feeding delicious treats to Bikini Bottomites, in exchange for Holiday Spirit Bottles which can be used to obtain exclusive Holiday decorations! Ain't that just simply awesome? Nickelodeon also hinted at the "return" of a very special character at the end of the Community Event. Who could he or she be? Plankton? Santa? Robo-SpongeBob? We'll just have to wait and see. And we'll let you guys know as soon as we find out! Well, we've gone on long enough here. There's a whole guide below on everything related to this update and the event, including items and recipes. What are ye waitin' fer? Scroll down now! 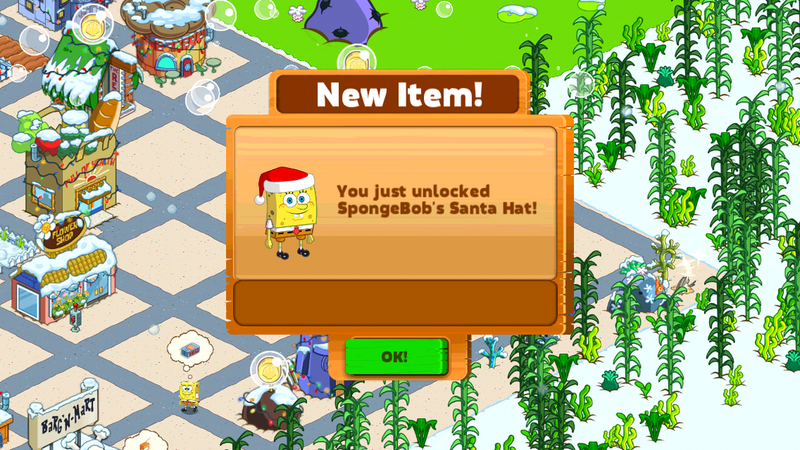 UltimateSpongeBob101 wishes everyone a very Happy Holidays! 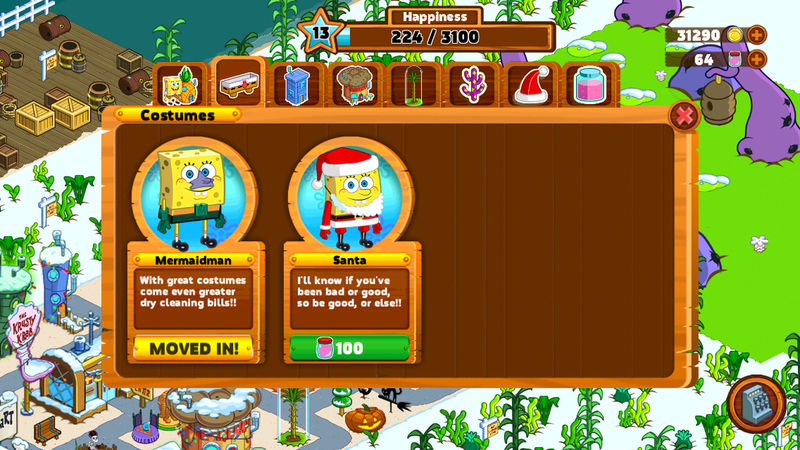 Old man winter has returned to Bikini Bottom, bringing lots of snow with him! Bikini Bottom Bulidings are decorated in lights. What's missing? It's the Christmas spirit of course! 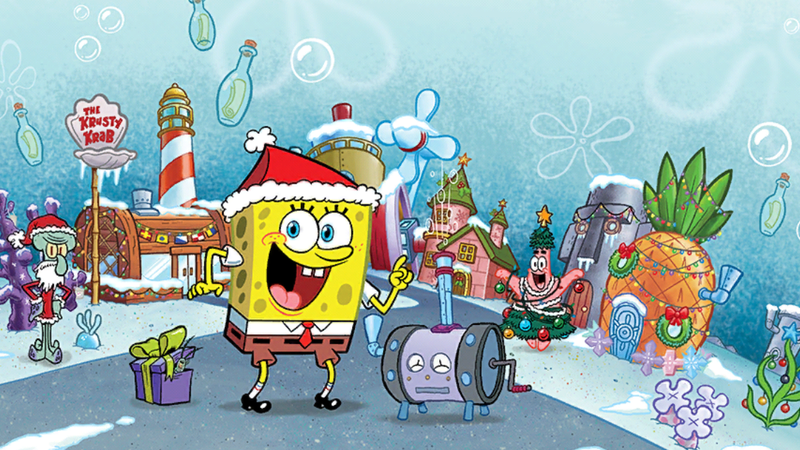 SpongeBob and Patrick are taking it upon themselves to spread the Holiday cheer and things don't go very well at first. They need your help to get people to put aside their Thanksgiving leftovers and Halloween candy and get into the festive mood! 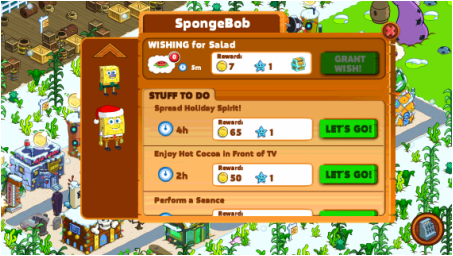 First up, get SpongeBob and Patrick dressed for the holidays! Next, feed bottomites the recipes that we've listed further down. Lastly, redecorate! That's where the Community Event comes in! We have a complete quest guide for this event which you can visit here, at your leisure. 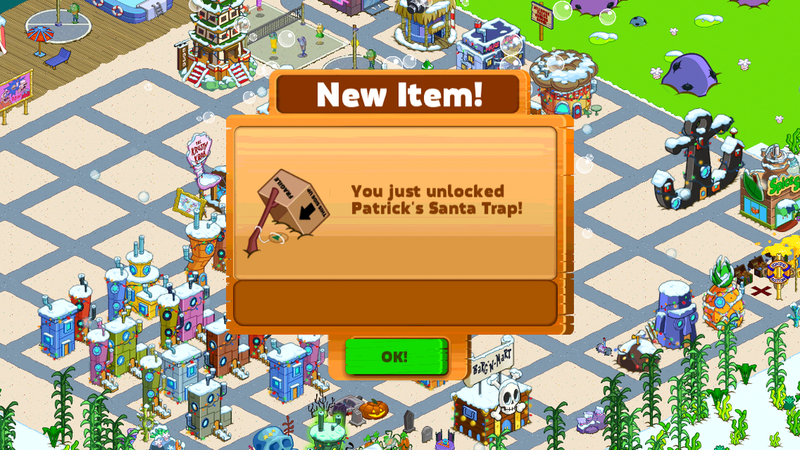 Have a merry December and get ready to wash some of Patrick's socks in January! We're just kidding about that. Merry Christmas! 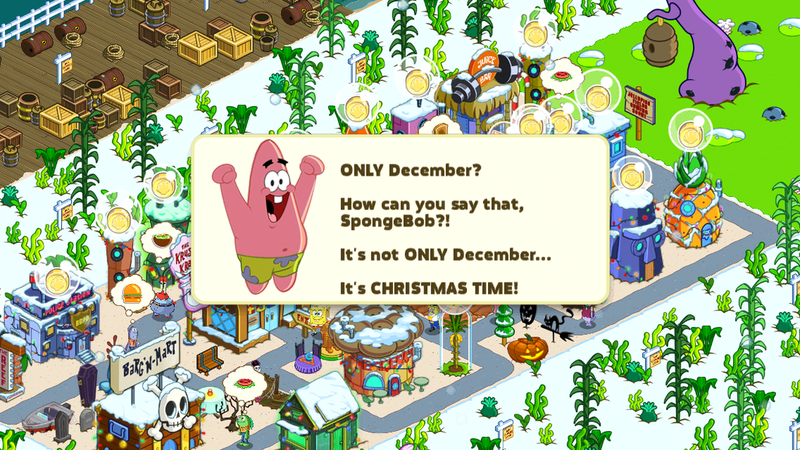 Dress SpongeBob in his Santa Hat and Patrick in his Holiday Tree Suit and they'll be able to do the "Spread Holiday Spirit" task! There's some cool animation to view! The task is limited to the two characters in their respective outfits...or is it? Wouldn't it be cool to see Squidward spreading some holiday cheer! 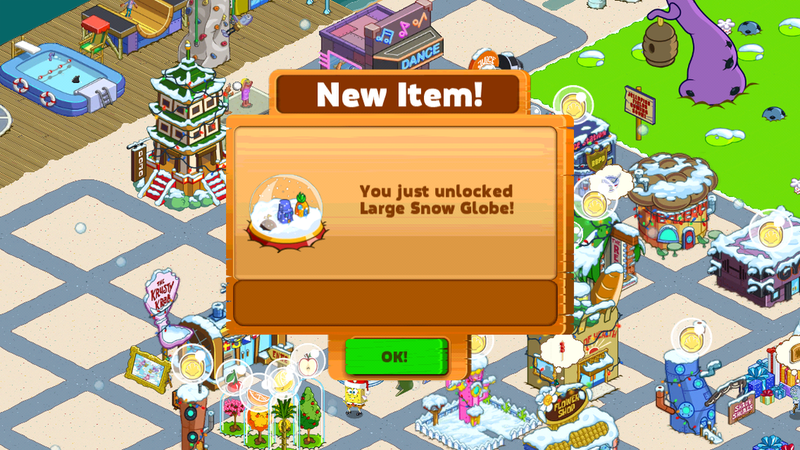 Well, you'll be able to once you unlock the Large Snnow Globe from the Community Event! 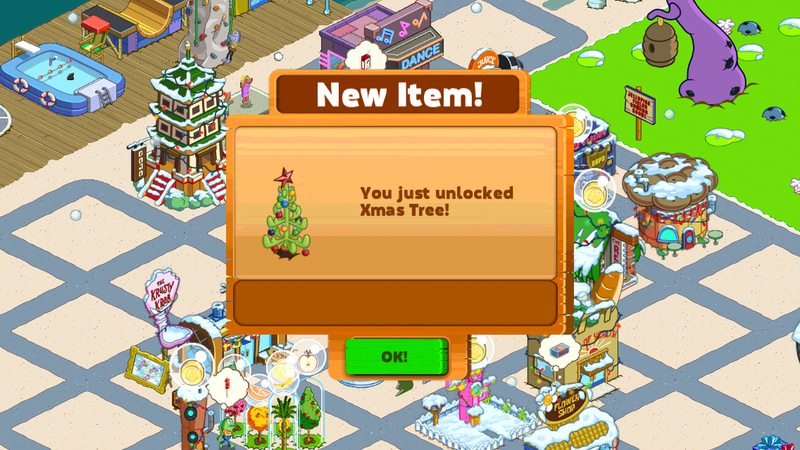 It's a Christmas Miracle! Move In the Spice Shack and Treat Shop! 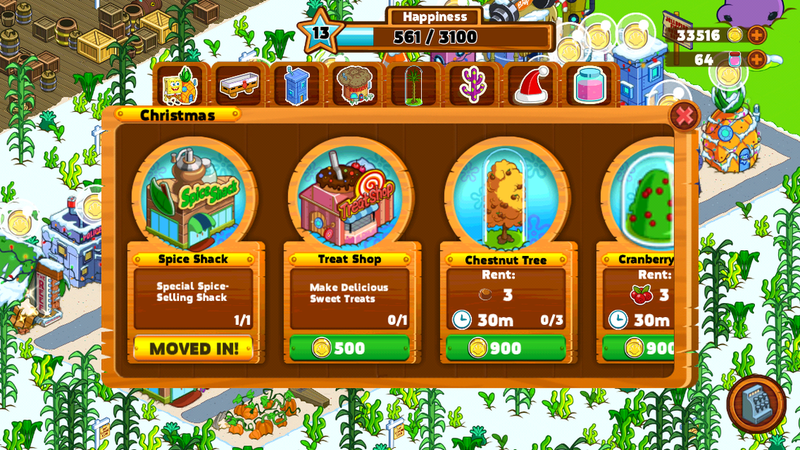 Similar to the game's Halloween 2014 Event, this Holiday Event included the return of the season-themed stores, one of each from the two store categories. 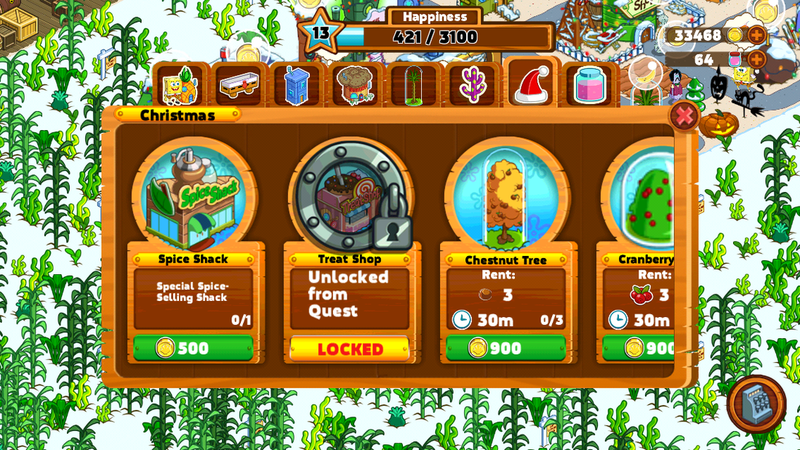 Throughout the main part of the quest line, you'll be required to unlock the Spice Shack and Treat Shop in order to make Holiday Treats that can be fed to SpongeBob, Patrick or Squidward for extra Holiday Spirit Bottles. 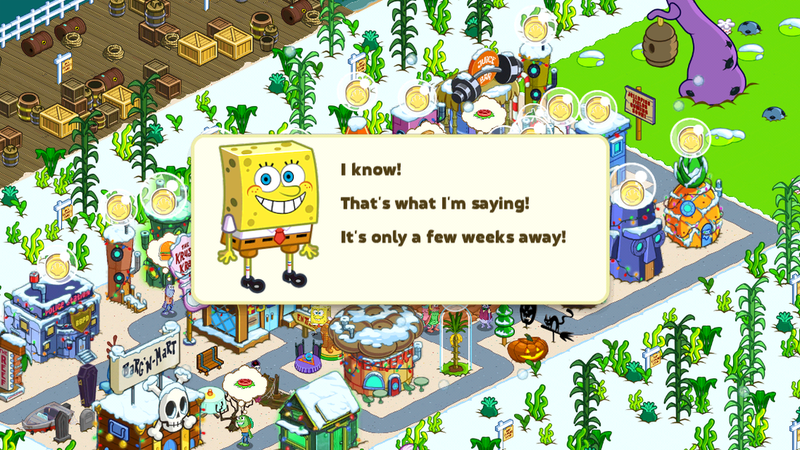 Unlike last year's Holiday Event, this event did not see Bottomites requesting Holiday Treats, which might be part of Nickelodeon's water-testing for future events. Overall, we're pretty sure players would want to be able to feed every bottomite Holiday Treats for extra Spirit Bottles, right? Grandmas' Snickerdoodles and other Great Holiday Treats! As with every new event, there are more new recipes to make! 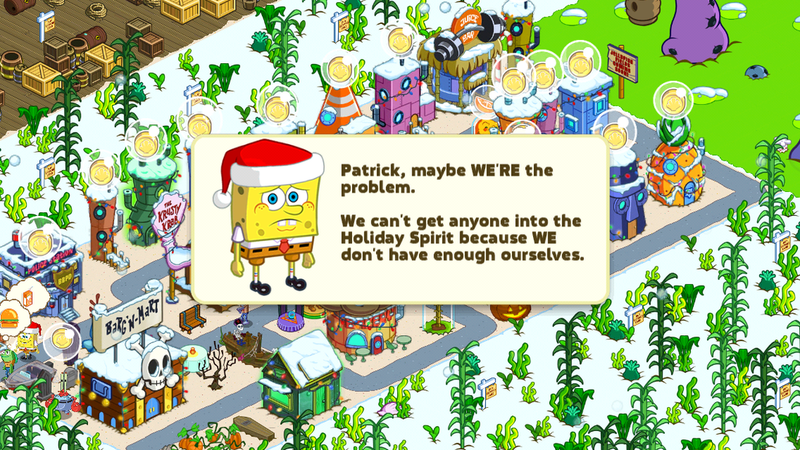 This time, SpongeBob and Patrick aren't very successful in spreading holiday cheer. However, all is not lost! You can make 5 new recipes in this event (excluding base items), of which we have listed below. Finishing the pre-Community Event quest line should get you all 5 recipes, and the ability to move in the Spice Shack and Treat Shop. Don't forget, you can also earn Holiday Spirit Bottles by feeding bottomites with holiday treats! Aside from the great costumes that SpongeBob and Patrick get in this event, there's also a new "Costumes" tab (which is denoted by a pair of SquarePants) in the store! You can now purchase costumes that were released in past updates. At this writing, only the Mermaid Man and Santa costumes for SpongeBob are available. Patrick's Barnacle Boy costume and Squidward's Tuxedo costumes are not present, unfortunately. Still, this is a great new feature set forward by the developers! This event features a new limited-time only currency, known as Holiday Spirit Bottles, which you can obtain by feeding holiday treats to bottomites, or having bottomites do tasks. 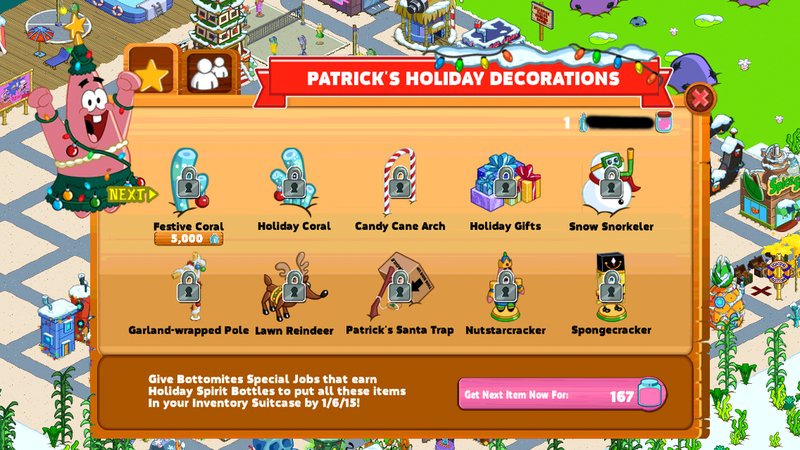 These bottles can in turn, be used to obtain 10 different exclusive items in the "Patrick's Holiday Decorations" collection. 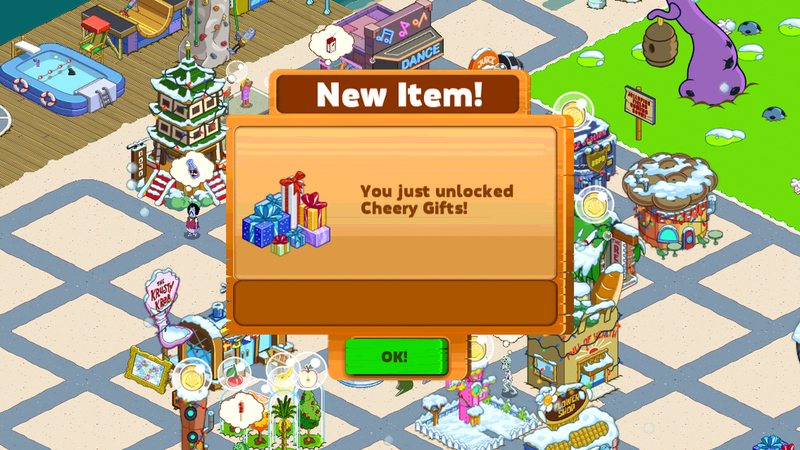 All of the items were originally released in the Special Holiday Store during the Holidays 2013 Event. Like all past Community Events, these 10 items can be obtain using either the special currency (holiday spirit bottles), or Jellyfish Jelly. We have listed all the items below. 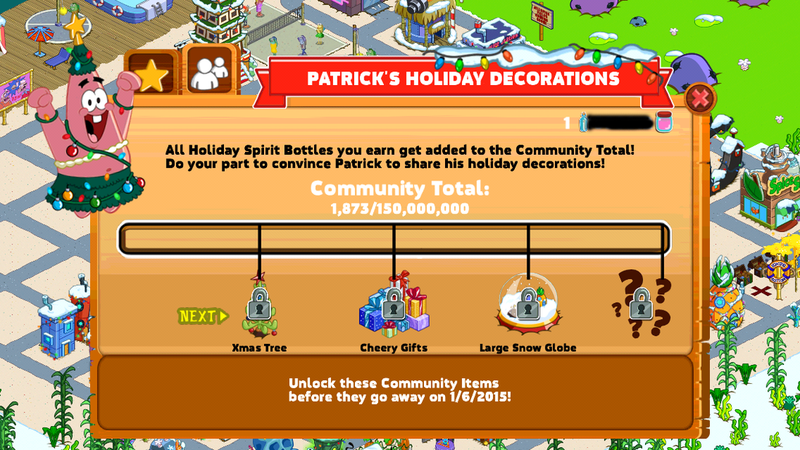 All of the items actually have the same cost of 5000 Hoilday Spirit Bottles or 167 Jellyfish Jelly. Celebrate as a Community! Unlock Exclusive Items! Once again, the Community Event is back! 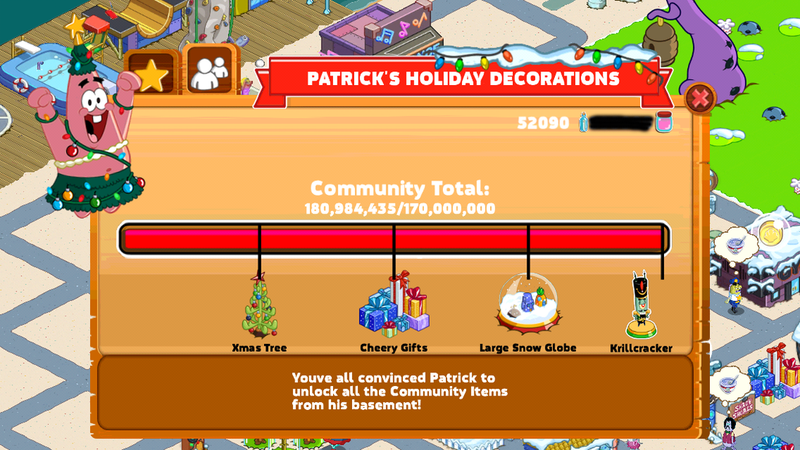 There are still some remaining decorations that Patrick refuses to let go of! That's where every player comes in! Every Spirit Bottle players earn goes to the Community Total. Reach certain thresholds of bottles and everyone receives a special decoration. There are four decorations in this section of the event, of which the last reward is Top Secret! What could it be? We'll let you know when we find out! Oh and we forgot to mention that progressing in the Community Event allows you to unlock the final pieces of the storyline for this Event! What are ye waiting fer? It's time to work together! We've made a list of the unlockables for this event below. Q: How do I get the different holiday costumes? A: Unlock holiday costumes by completing holiday quests. Check your quest menu on the left side of the screen by tapping the notebook to drop down the icons, and click the icons to read the steps in order to complete the quests. Completing the quests will unlock almost all the costumes except the ones missed in previous events. Those costumes can be purchased in the new costume tab in the store. Q: I don’t see a Wish Bottle Launcher. How do I get it? A: To unlock the Bottle Launcher, complete the quests for the holiday event. 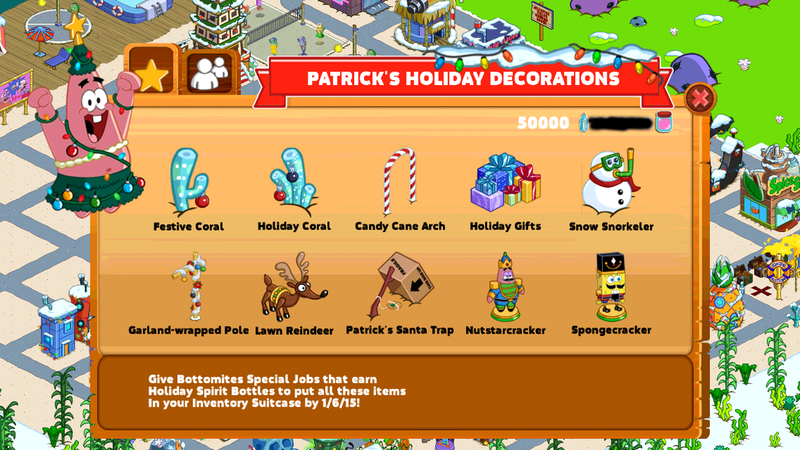 In order to start the holiday event, you have to move in Patrick, Squidward and have the abrasive costume for SpongeBob. Q: Ok, I don’t see the next quest I expect to complete. Why? A: Please contact customer support so we can figure out where you are and provide you with the help needed to get to the next part of the game. Q: What can I do during the Holiday event? 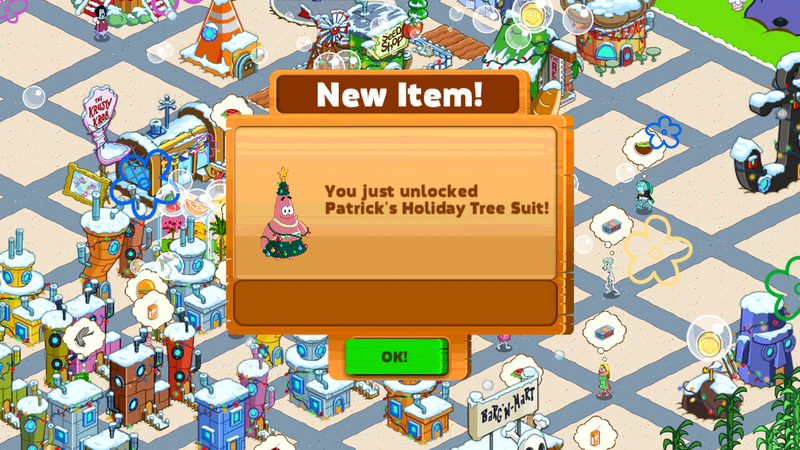 A: During the Holidays in Bikini Bottom you can unlock costumes, decorations and even begin a quest line that will bring a sorely missed character to Bikini Bottom! Make sure to get through the whole event, so you can unlock the special item to start the process to unlock a brand new character. Q: What is Holiday Cheer? How do I help unlock the Community Rewards? 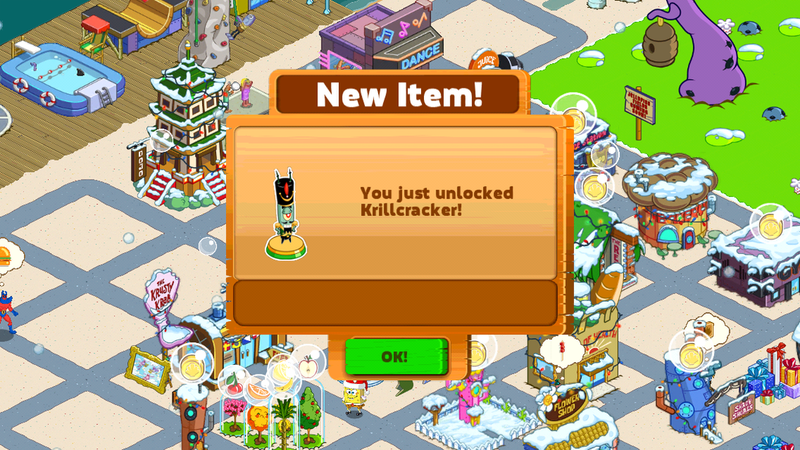 A: Holiday Cheer is the Holiday Spirit Bottles that you are given for completing the task to use the bottle launcher. All players will contribute to the community total, so keep coming back and sending bottom its to the bottle launcher and collect those bottles. At the end of the community event all players participating will unlock the special surprise decoration that will trigger a quest line to unlock a very special character. Q: What’s a Wish Bottle? How do I get one? A: Holiday Spirit Bottles are rewarded by having bottomites in your town sending bottles using the bottle launcher. Q: Where do I get Cranberries and Chestnuts to make holiday food? A: You can get the Chestnut Tree (used for the Bread Pudding) and the Cranberry Bush (used for the Sugar Plum) in the Christmas tab of the Store.